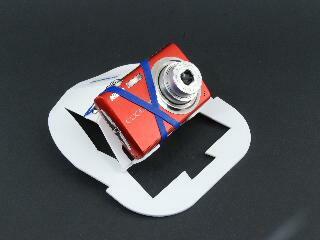 The CameraClip is a simple device that allows you to take clear pictures or movies while riding your bicycle. It works much like a paperclip: one part of it slides into the rear pocket of your cycling jersey, the other part remains on the outer side and supports the camera or smart phone. Hence, the CameraClip. It is suitable for compact cameras but most smart phones as well. The pelvis of a bicycle rider is very stable. This stability is a great basis for any type of camera support. Moreover, with this device you will be taking pictures of the front end of your cycling buddies instead of the rear end as seen by many manually operated or head mounted systems. 1. Time lapse pictures (every 10, 30 or 60 seconds).